This charger was purchased to charge, discharge and analyze the two battery packs in the 5590BAv2 Battery Adapter. The pack shows above consists of two series strings of 10 SubC cells. The pack wiring and battery socket wiring is 14 AWG super flex wire. Also the cable connecting the Triton2 to the battery pack has Banana Plugs on the Triton end (Tower Hobbies HCAP0310) that have been modified to take all the strands in the 14 AWG wire. On the other end is a pair of Power Pole connectors with 45 Amp contacts. The power supply is one that was already here, an Astron SS-30M. It's a 12 Volt" supply good for 30 Amps. The rear panel connectors are Austron custom Banana Jacks that have a pinch screw so the Triton input Banana Plugs fit without any modification. The Triton2 is not suitable for load testing the pack since it's rated for only 20 Watts (1.4 Amps @ 14 V) Amps discharge but the SubC cells are rated for 30 Amps. The wire and Power Pole connectors in the 5590BAv2 are rated to carry 30 Amps. The Amrel EL1132 Electronic Load can test up to 300 Watts but that's still short of the 840 Watts (28 Volts @ 30 A) the battery Adapter should deliver. But 10 Amps is better than 1.4 amps. The more important thing is a good way to charge and confirm the capacity of the two 10 cell packs. Single Channel i.e. only one pack at at time. Discharge current 0.1 to 3.0 Amps or 20 Watts whichever is lower. The LCD is a 16 character by 2 line type which works in a multilevel menu scheme. This minimizes the display cost thus lowering the final price of the charger, but at the price of hiding information making it harder to use the charger. There are some key concepts that once you get (not by RTFM) then it's not too bad. The first thing to understand is that there are 5 battery types: (1) Memory, (2) NCad, (3) Ni-MH, (4) Li-Po/-Ion and (5) Lead Acid. The Memory battery type is indexed and has 10 possible values. There is no seperate factory set of values just the 10 channels. These come from the factory setup, but once you change them there's not way to get them back other than manually programming. Each time you press the BATT TYPE key the charger takes on the personality associated with that battery chemistry. For example any setting you do in the (1) Memory battery type, say like setting it to Ni-MH and setting the charge and discharge currents, will have no effect on the (3) Ni-MH battery type. This caused me a lot of confusion when first using the charger. For each battery type you can define things like pack nominal voltage, charge and discharge currents. In the top Memory battery screen the only thing that can be changed is the index number (1 to 10). The pack voltage and capacity are changed in lower menus which are accessed with the knob. You can press the BATT TYPE key when in any of the Battery Type menus and it will take you to the top menu in the next highest numbered battery type. Type (5) [my numbers, not Triton2] Lead Acid goes to (1) Memory. Since it's just a button you can only go in one direction round and round the list. Note that for each index into the memory the pack voltage and capacity is displayed to remind you what is in that index. The (1) Memory battery type does not have any action keys, just things that define a battery pack. So if you are in any of the (1) Memory battery type screens and press and hold down the knob nothing will happen. The Triton2 stores any parameter change when the knob is pressed causing that parameter to stop blinking. If you power down the Triton2 right after that knob press and power it back up the change will be remembered. When in the (1) Memory battery type menu and you press the MENU CHANGE key the Triton does two things. First it jumps to that action battery type that matches the current Memory battery index you have selected. Say you have selected a Memory battery type that's a Ni-MH. The next screen will be the top screen for (3) Ni-MH. Then all the parameters that were in that battery type will be erased and replaced by whatever was defined in the memory battery type. This can be confusing if you don't realize that selecting a memory overwrites the non memory battery type. Note there's a subtle difference in how the memory screens are labeled and the action screens. The memory screens have inputs saying "charge current" or "discharge current" and the action screens have inputs like :NiCd Charge" or "NiCd discharge". On any of the action screens you can press and hold the knob to start that action. The action might be to charge, discharge, cycle starting with charge or cycle starting with discharge. The next screen will be a Working Screen. On any of the action screens you can press MENU to get to the setup screen associated with that chemistry. The setup parameters are different for each of the four chemistries (battery types (2) through (4)). Each of the four action battery types has setup parameters associated with it. These parameters are related to the charging or discharging of that chemistry more than they are with the pack configuration and so are not part of the memory settings. Each setup parameter in the table is independently memorized. The factory default sound is set to 1 for each chemistry. It might be better to use a different sound for each chemistry so if you were not paying attention you would get a warning of a mistake. From any setup parameter screen when you press the MENU key you go back to the action screen that you used to get to the setup menus. For example if you were doing a "NiMH discharge then charge" and pressed the MENU key you would go to the top screen in the next chemistry group, i.e. the Sound parameter in the NiMH chemistry group. After changing the safety timer you could press menu and go back to the "NiMH discharge then charge" screen. This is inconsistent with the way the other menus work. For example in the Battery Type menus if you are on the NiMH discharge current page and press the BATT TYPE key you are sent to the top of the next menu or the LiPo charge screen, not the LiPo discharge current screen. Note that when the Triton2 is working you can not access the setup screens. This is a design defect that hopefully will get fixed in a newer version. For example at a minimum you should be able to see the setup parameters while the Triton2 is working and even better change the settings while it's working. It could be a problem if you need the NiMH max charge or top-off charge. If you stop the charge to view the setup setup parameters and restart the max charge mAh will have no meaning. The same for the top-off charge. If you see this screen the charger is working. Note the Triton2 has a 20 Watt power limit. For example when I'm discharging a pack of 20 Ni-MH SC cells and the discharge current is set to 3 Amps on the working screen the current might be 0.7A when the pack voltage is 27.14V. This is because the Triton2 measures the pack voltage and adjusts the current so that the power is kept under 20 Watts (i.e. 0.7A * 27.14V = 18.9W, if 0.8A & 27.14V the power would be 21.7W). STOP just press MENU MENU. Sometimes it might take two presses depending on which screen you may have navigated to. On the first working screen described above just one press will shut down the charger. Turing the knob when in the top working screen displays the time in hours minutes and seconds. You can go back and forth between these two screens with the knob. While the charger is working you can press the BATT TYPE key to see details on the current task. This menu does not wrap. To return to the main working screen press MENU only one time. You might see a battery temperature higher than you expected and want to stop while watching this screen so to stop press MENU MENU. After the action has finished you're supposed to be able to access the detail screens by pressing <MENU><BATT TYPE> at the same time. Sometimes this works for me and sometimes it does not. When it does work and you have been doing cycling you can press the knob on the page that shows the cycle # then rotate the knob to see the Charge and Discharge mAh for each cycle. This is very good info to see. If the battery is leveling off then it has been reformed or if it keeps gaining capacity then it needs more cycles. The supplied manual is poor in describing how to use the Triton2 and after a few days of use is falling apart. There's no stated way to get tech support that's charger specific. The Triton2 can be set to display deg C or deg F. The range of over temperature shutdown values is 10 to 65 deg C in 1 deg C steps or 50 to 150 deg F in 2 deg F steps. The Electrify GPMM3151 Thermal Probe uses the same "J" connector as the external battery for the Watt's Up. The actual sensor is a TO-92 packaged IC not a thermistor like is used for the military batteries. It's too big to fit into the triangular space where three SubC cells are touching. White (front most pin on Triton2) = +5 VDC to sensor. National Semi (and others) make three terminal temperature sensors in the TO-92 outline as used for the Triton2 sensor as well as other outlines that may be a better fit into a battery. These 3-terminal temperature sensors come in 10 mv/deg F, 10 mv/deg C and 10 mv/deg K. They also make them with an offset so negative C or F temperatures can be measured and only use a single power supply. The Triton2 sensor is has about 0.183 volts when the room temp is about 18 C (18 * 10 = 180 mv). Candidate (i.e. NOT tested, just guessing now) part number is: LM35,( LM45 is SOT-23 version of LM35). The spacing between the temperature sensor and the other pin on the factory temperature sensor can be changed by loosening the screw. When wide open the sensor-pin will just straddle a couple of SubC cells that are touching each other and so could be used on the edge of a SubC pack. It would be much better to sense at the center of the pack where it will be hotter. The first test of the SubC pack was to discharge it. That only took a few minutes. It's been sitting around for many months. The discharge is limited to 20 Watts, so with a 10 cell pack the max current is 1.4 Amps, not the 3 Amps that's applicable for packs below 6.6 Volts. If both sides of the 5590BA battery adapter are connected in series (20 cells total) the max discharge current is 0.7 Amps. The EL1132 is good for 300 Watts discharge. The first charge attempt was a plain Ni-MH charge at 1 Amp, but after awhile the beeper went off with a message about safety timer. Now I've set the charge for 0.3 Amps and 660 minutes on the safety timer, the recommended values for Breaking In a 2.2 AH battery. After 137 minutes on the 0.3 A charge the battery voltage is only 12.75 so they have a way to go. When using the default modes like Ni-MH charge or discharge the safety timer reverts back to default whenever the connection to the battery is opened. Thus even if you just set it to 660 minutes and the Triton2 has been powered all the time, it goes back to the default condition. When the time-out error occurs it appears you loose all the data like how much charge was put in or taken out, &etc.. So it's best NOT to use the generic mode but instead use one of the ten memory channels where your settings will be remembered. Even after you setup a memory there are still settings that need to be manually set, like the time-out timer under the Menu/Change button. The time out timer seems to reset all by itself! The human interface on this unit is what might be called user hostile! It's far behind the Maha C9000 which is intuitive to use and you don't need to refer to the manual for every step of the way, but to be fair the C9000 uses a much larger custom LCD. The C9000 LCD has a box with the words CHARGE, REFRESH ANALYZE, BREAK-IN, DISCHG and CYCLE always on. A ">" points to the current mode. To the right of that are other words that get turned on or off. Using banana plugs on the output of the Triton2 was a mistake in my opinion. The reason is that when you unplug the Banana Plugs you have disconnected from the Triton2 BUT you are still connected to the battery. If the plugs short together the full battery current will flow! Something that's all too easy with Banana plugs. A much better choice of connectors would be Power Poles where there are no exposed electrical terminals. Another option would be to use shrouded banana plugs, like on handheld Digital Multi Meters, but then it would be hard for a hobbyist to make up charging cables. The Power Pole option allows for easy home cable construction. 2 Nov 2007 - Now have memory 5 setup for 20 cells Ni-MH and have reconnected the Power Poles on the battery pack to put them in series. One of the strong points of the Triton chargers is that they can handle a 20 cell pack. Doing a couple of cycles of discharge -> charge at 0.3 Amps (2.25 AH cells) to help them come back to life (I hope). 9 Nov 2007 - That's not any way I've found to know what it's doing if you change the display after starting it. And you want to check the menus after starting to be sure that one of the key items is set properly, like the time out timer. 21 Nov '07 - The problem is if you press MENU when on the charging LCD page the charging will stop. Once stopped no amount of searching will find it again. An improvement would be to add a Red and Green LED which would turn on during Discharge or Charge. Connecting a Watt's Up to the output is also a handy way to see what the Triton2 is in. 14 Nov 2007 - when working with the military 5590 series batteries it's good if you can see the gas gauge and have access to the thermistors. The stock Fair Radio 490-CO-ZZ1 battery plug has a metal plate that covers these up. But it's an easy change to rotate the plate to expose them. You want the plate because it gives you a handle to help pull the socket from the battery. The guide pins are not needed since the plug has 5 key ways and will only mate in one rotational position. 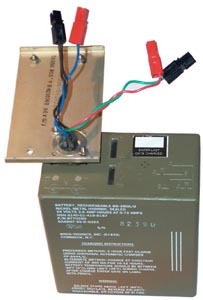 Also some batteries, like the BB-557 may not have enough socket float to allow for the pins and the key ways. With all 5 keyways the socket will mate to both primary and secondary 5590 family batteries. The power poles have not been glued together so that the two sides of the 5590 battery can be connected separately or in series. 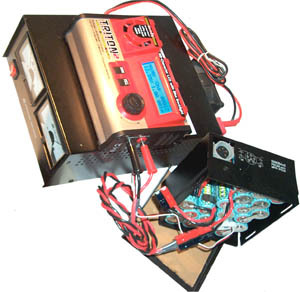 The Triton2 can charge the series connection. Now the gas gauges and the thermistor contacts are accessible. The thermistor contacts are the two round brass contacts just below the socket. After charging just pins 3 & 4 the resistance from the left and right contacts to the center socket were 7k7 and 4k4 Ohms..
At room temp they are 13k2 and 13k0 Ohms in this BB-390. When and 5590 battery is positioned like shown where the socket is in the upper left corner pin 1 is at the top and is next to the wide key way. I'm working on a user guide for the Triton2 that might overcome some of it's user hostile nature. page created Nov 2, 2007.